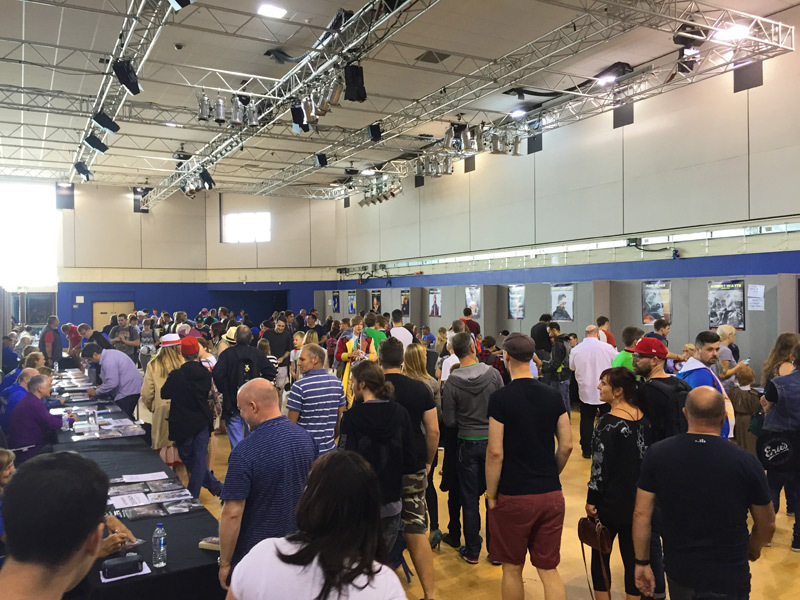 And welcome to the second day of Showmaster’s Film & Comic Con Bournemouth! After my adventures on the first day I was a bit tired from meeting all the amazing actors but I was very happy to go back to meet more Doctor Who stars! 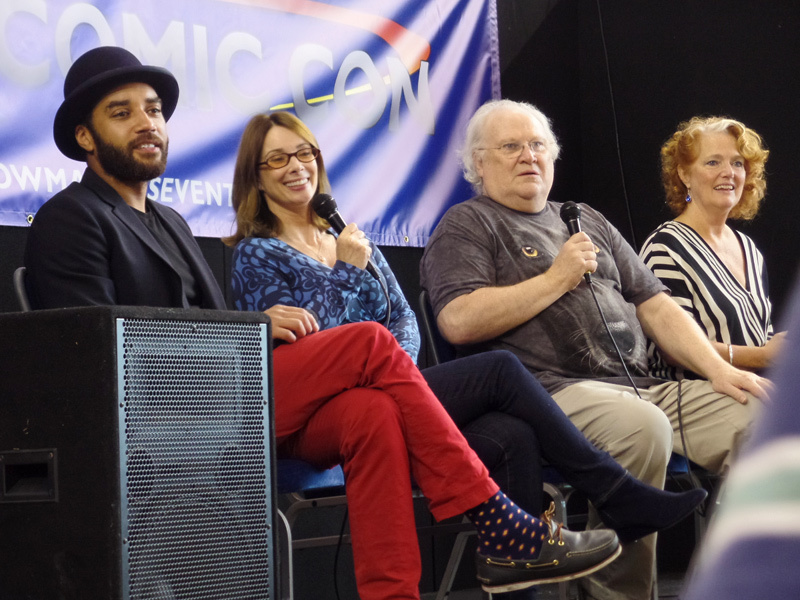 First show of the day was the Doctor Who talk and out came Louise Jameson ( Leela), Nicola Bryant ( Peri), Samuel Anderson ( Danny Pink) and the Sixth Doctor himself, Colin Baker! The Q&A was very interesting and lots of fun. The guests were asked to describe their Doctor Who experience in one word. Mellifluous means sweetly or smoothly flowing, sweetened as if with honey. I know, because I looked it up! Hello Louise Jameson aka Leela! 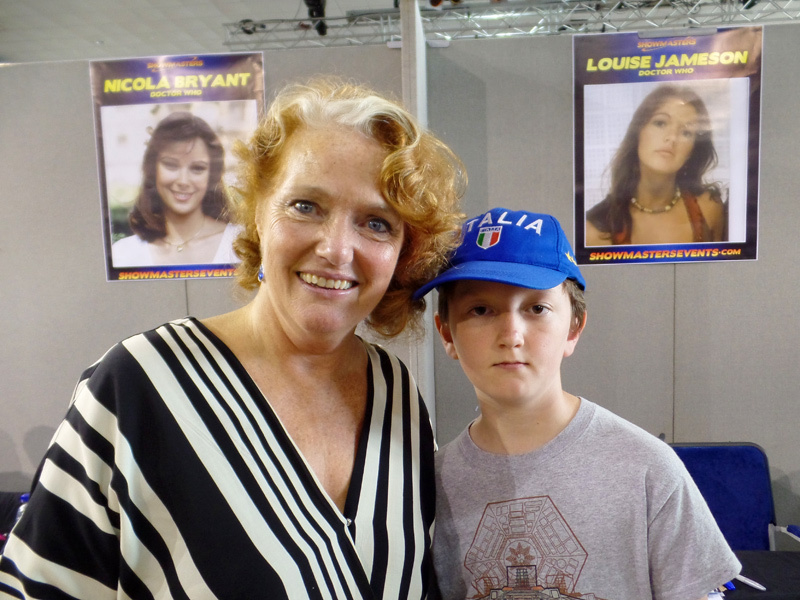 After the Q&A I said hello to Louise Jameson – I didn’t ask her my golden questions because I asked her already at the Timeless Collectors Fair. Louise was very kindly to me and she told me she enjoyed the Q&A which was the first one she had done with Sam, and she thought he was great! Hello Lalla Ward aka Romana II! 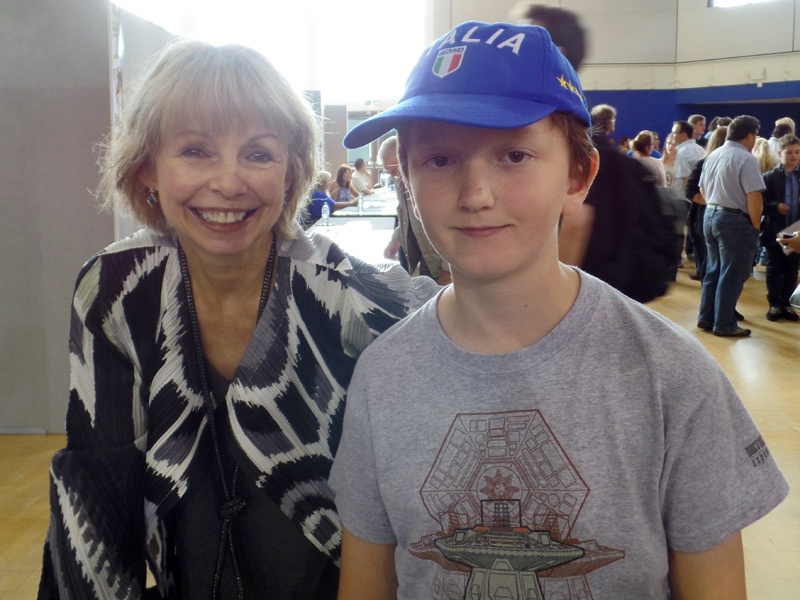 After Louise I met Lalla Ward who played another Fourth Doctor companion Romana II! It was great to meet Lalla for the first time and she was very polite and answered my Golden Questions. What is your favourite Doctor Who episode? If you could go anywhere in time and space where would you like to go? Lalla’ s favourite Doctor Who episode is City of Death (1979). Lalla showed me a photo of Romana II in Cambridge in the episode Shada (1979) which was her favourite filming location. Sadly Shada wasn’t finished because of a strike, and wasn’t shown on TV but it was released on video in 1992. If Lalla could go anywhere in time and space she would like to go back in time and see the dinosaurs, but she would want to take a bodyguard to protect her! She would also like to visit other planets and make contact as she believes that there must be life on other planets if there is life on earth. I think she may be right! It would be nice to know we are not alone in the universe but I hope that aliens would be friendly if they did come to earth. Hello Nicola Bryant aka Peri! 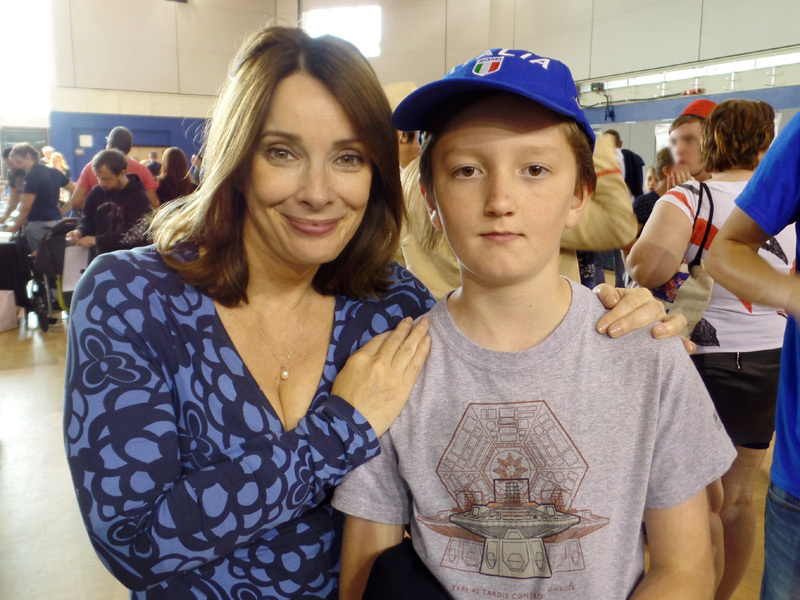 Next I met Nicola Bryant – Nicola played Peri , companion to the Fifth and Sixth Doctor. I have met Nicola before at the Fleet Air Arm Museum and she is lovely. I was really pleased to meet her again. Nicola cannot choose a favourite Doctor Who episode because as soon as she thinks of one she remembers another she likes just as much. She loves them all! Nicola’s favourite filming location was Seville where she filmed The Two Doctors (1985). She said the food was great. When I met the Sixth Doctor, Colin Baker, his answer was the same so I guess they had a good time! Lastly Nicola told me that if she could go anywhere in time and space she would like to travel back 25 years and see her father who sadly passed away. She said the best times are times spent with loved ones. I agree, I would love to use my TARDIS to visit my Great – Nana who I miss very much and my Grandad who I never got to meet. 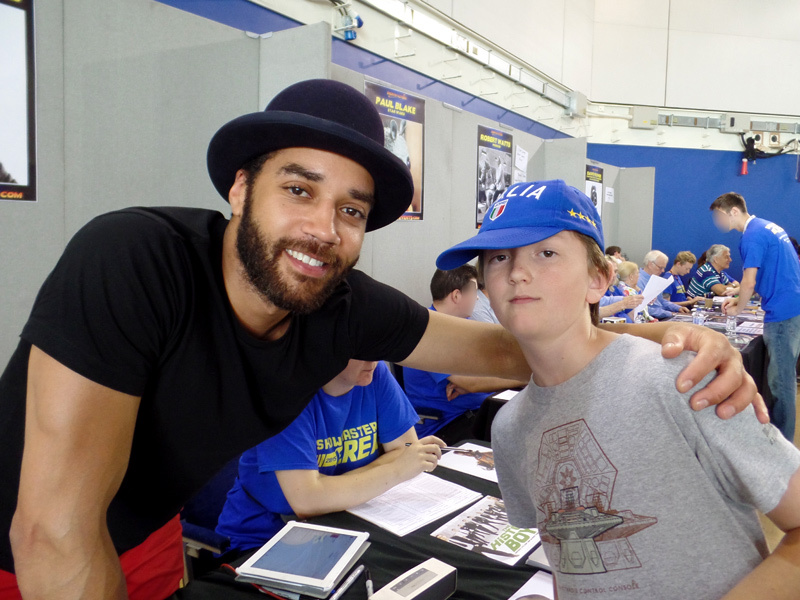 Hello Samuel Anderson aka Danny Pink! 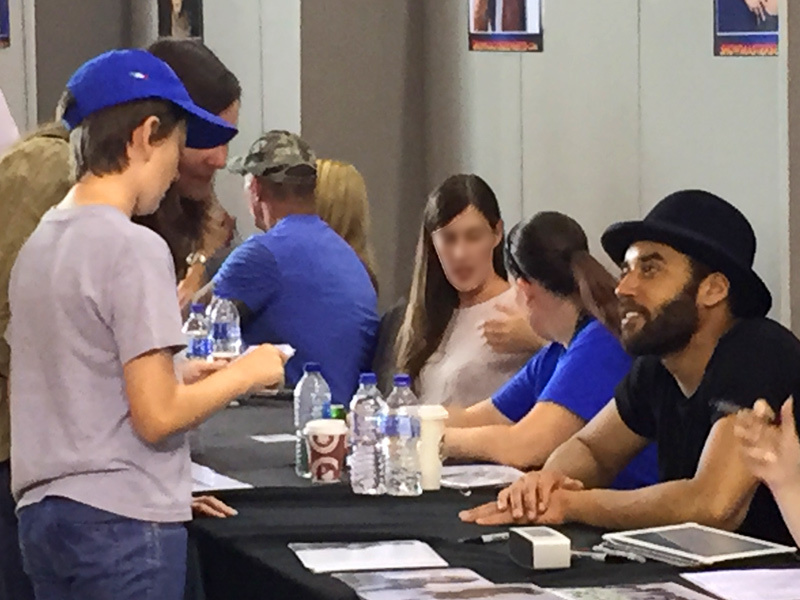 Finally I met Samuel Anderson again – Sam played Clara’s boyfriend Danny Pink and his ancestor Orson Pink. Sam was the first ever Doctor Who actor I met as I got his autograph at the Doctor Who World Tour in Cardiff in 2014! In the queue I met Luke who was carrying a TARDIS door. He was asking the Doctor Who actors to sign the door then he was going to take the door home to put back on his own life-size TARDIS. I wonder if it is bigger on the inside? Sam was mellifluous – Ha Ha Ha Ha Ha Ha Ha Ha! His favourite episode is Death in Heaven (2014) – even though it meant he lost his job! He enjoyed filming in a bar because he got to sneak a beer – shhhh! His favourite Doctor Who filming location was the set of the TARDIS because it is kept under lock and key and not many people get to film there! Sam would like to travel in time to see the dinosaurs, and the pyramids being built, but he would REALLY like to go to Harlem in the 1940s and see the Jazz Greats performing. 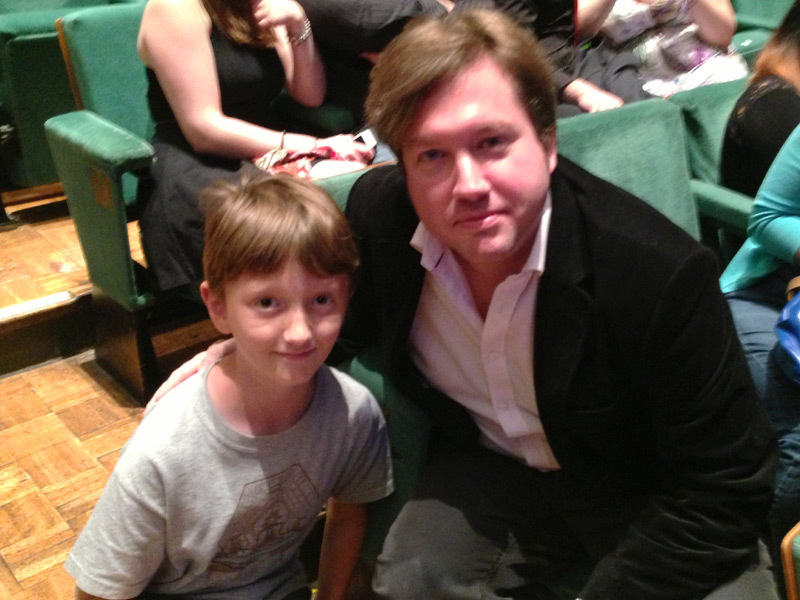 I told Sam that Doctor Who Script Editor Andrew Cartmel told me that as well – they should hang out together. Sam is a Jazz Singer too – maybe one day Jazz fans will want to travel in time to see Sam singing! Sam was supercool, it was great to meet him again and he was very encouraging about Project Indigo. Thanks Sam! After I met Samuel I decided it was time to leave as I was pooped out from all the excitement of the weekend! As well as the Doctor Who stars there were film stars from all over the world, including actors from many film and TV Series Star Wars, even Darth Vader himself! And The Incredible Hulk! There were sports stars too. As I left I met footballer Ron ‘Chopper’ Harris and got his autograph – he is a Chelsea legend! I know it isn’t Doctor Who related but I am telling you about it because it meant a lot to me as I love football and support Chelsea (and Bournemouth of course!). Thank you to everybody who let me interview them, thank you to BH Live, and thank you to the people at Showmasters for giving me a Press Pass and helping me to meet with all the Doctor Who stars. 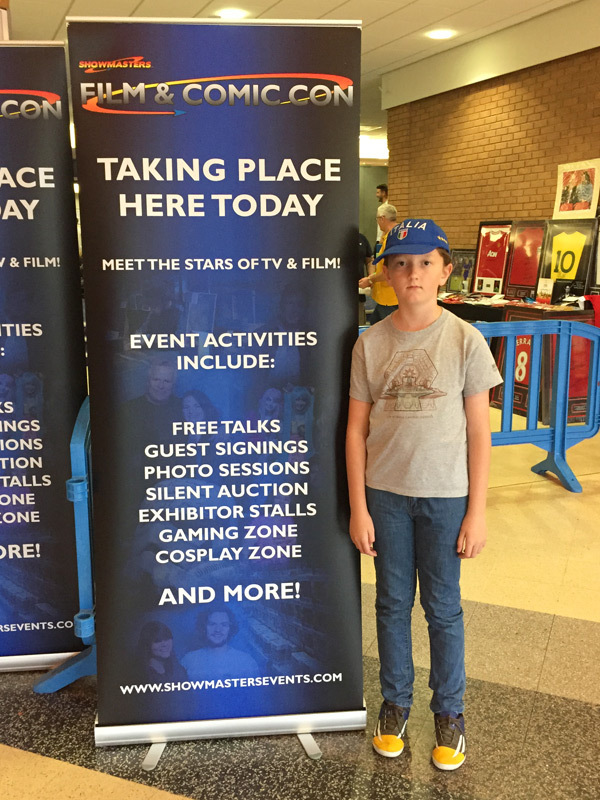 The first Film & Comic Con Bournemouth was SO AWESOME that Showmasters have created another and will be back in Bournemouth next year! See you soon for my review of the updated Doctor Who Experience – it was fandabbydozy. Now I am back on English soil and I am going to share with you the surprise I was telling you about! 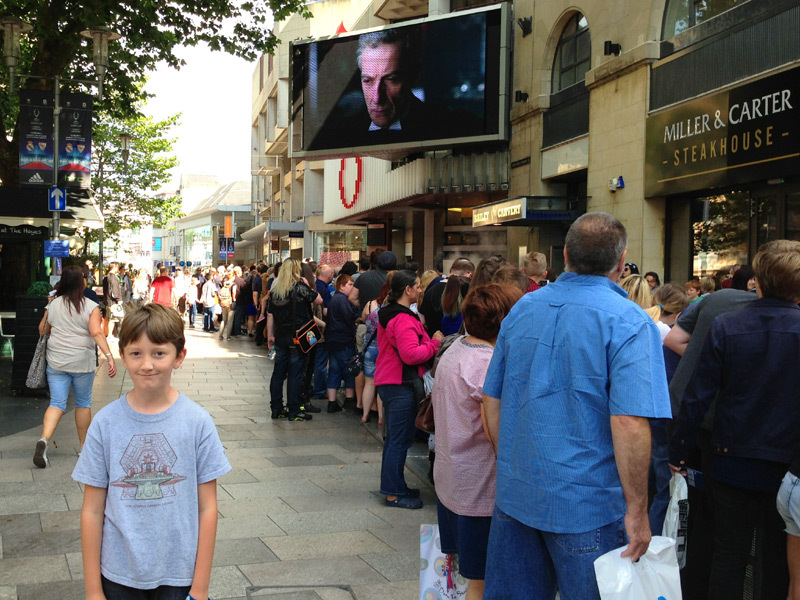 Yesterday I had a ticket to the Doctor Who World Tour in Cardiff and saw the premiere of Peter Capaldi’s first episode as the Twelfth Doctor – Deep Breath (2014)! It was fan-daby-dosy! I have been so excited and couldn’t believe the day had finally come. I arrived at the Red Carpet event and the street was very crowded full of people waiting to see the new Doctor and Clara. 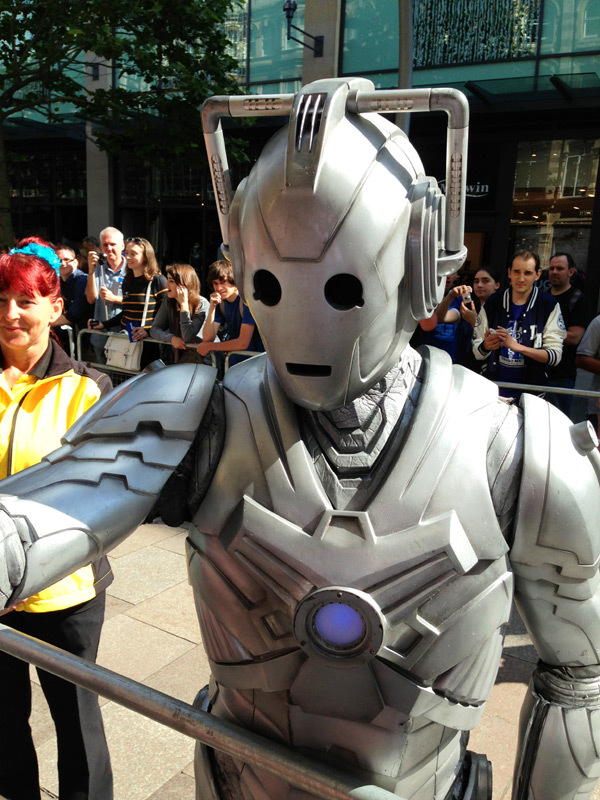 Some Daleks and Cybermen were going up and down and going up to people – not to exterminate or delete them happily – phew! I was very tired waiting and I thought my legs might drop off but suddenly the crowd pumped up and I knew the stars had arrived. First to go past was Jenna Coleman but she was very busy and had to rush off to an interview. She was wearing a bright red dress and walked right past me. Next to come down was Steven Moffat and I was really glad because I got to say hello and get his autograph! He seemed a really nice guy. Finally was (who did you expect) PETER CAPALDI! 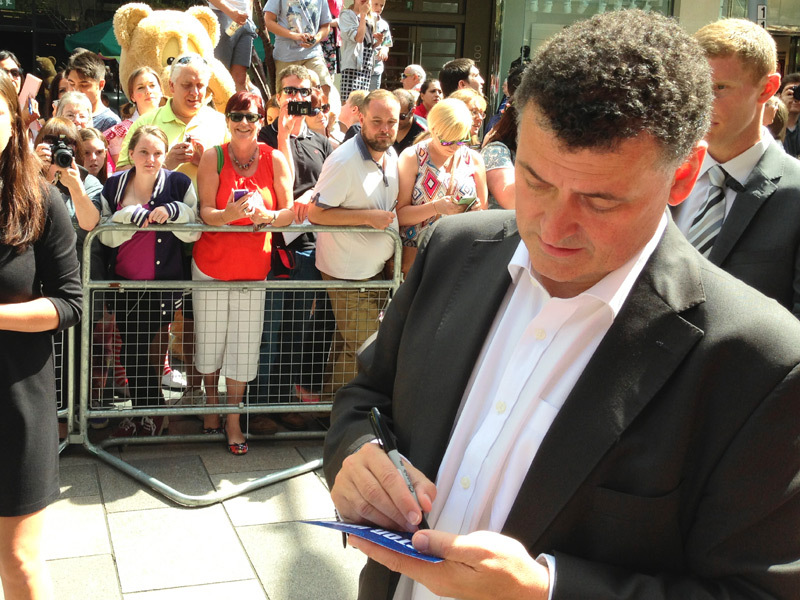 He was so busy signing his autograph on people’s cards, TARDISes and other memorabilia. Just as he got to my section he was dragged away because he was late, which was really sad, but he seemed very sorry himself as if he wanted to meet more fans. He was very smiley and friendly and seemed really happy to be the Doctor! After Peter went past it was time to go in St David’s Hall. The room was capacious and the seats went so high up. 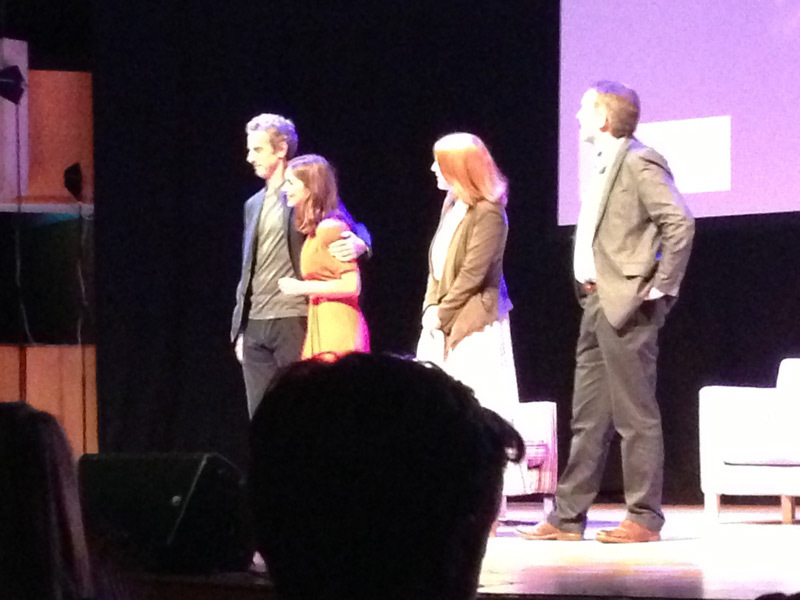 I was only four rows from the front, I had a great view and was so close to the Doctor and co. I felt so lucky and spoiled to have the chance to be there.Everybody was so busy and excited that they didn’t take notice of the rules and kept taking photos! While I was waiting something happened that I really have to mention – I met BlogtorWho! He’s a really great Doctor Who writer and I will be going to see his film Who’s Changing in a couple of weeks. He was a jolly chap and let me pose for a photo with him. Finally it was time and Jason Mohammad came out to present the show and said that we were the first audience in the WHOLE WORLD to watch Deep Breath. Next Rhodri Talfan Davies and Faith Penhale talked about BBC Wales and brought out Peter, Jenna and Steven before the episode started. We all agreed to keep what happens in the episode a secret so me is not spoiling it for you! So, I watched Deep Breath and it was dazzling and Peter Capaldi was EPIC. When I say epic I mean epic. I don’t want to give anything away so I will preview without spoiling. The Twelfth Doctor is funny, serious , smart , Scottish and smelly! The story is cool, creepy, life-changing, terrifying and breathtaking! I had to watch from behind my fingers for a bit but I loved it. 10 out of 10. The new Doctor is great and I can’t wait to see more of him. When the episode finished Jason brought out Peter, Jenna and Steven again to answer some questions. I didn’t ask a question because I was really shy but I wish I had. Peter said that playing the Doctor was terrifying, wonderful and a dream come true. He said that the show is a good thing that is met with joy and positivity and that he is so proud.My favourite part was when he said he didn’t know he was the only actor to audition for the part, that was so funny. Someone asked when they would like to travel in time to. Peter said Ancient Rome ( which he has already. Well , Pompeii). Jenna said Ancient Egypt or 1920’s New York. I would like to go to the Norman times or the 1980s. I felt so inspired by all the answers and very glad that Peter was a fan when he was my age. He is so happy to finally be playing the Doctor. 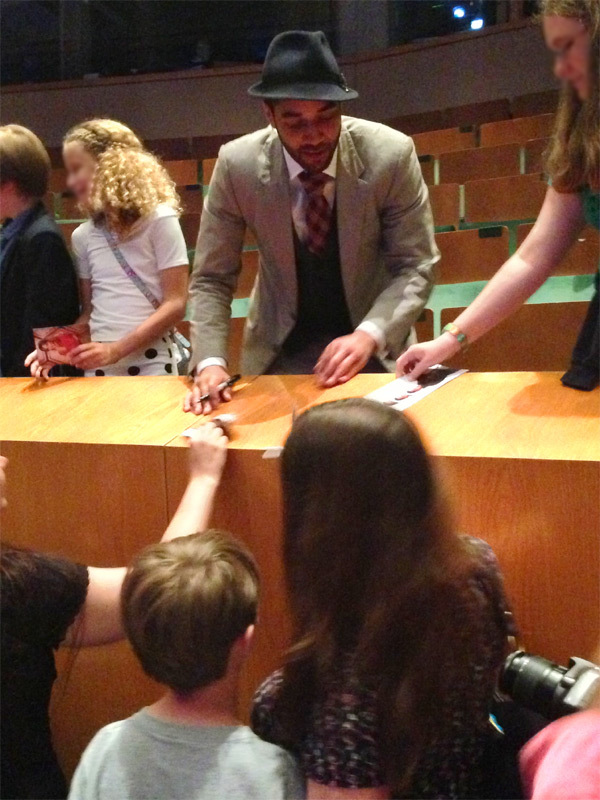 After the show I was lucky enough to meet Sam Anderson who plays the new companion, Danny Pink! He was very smart with a cool hat and spent ages signing autographs and posing for photos. I got his autograph and he said that no two signatures were coming out the same. Steven Moffat said he is the show’s secret weapon and nothing will be the same again. After it was over I was quite sad because I wanted it to go on and on and on. It was THE BEST DAY OF MY LIFE. I’ve had a great week in Cardiff and visited over 20 Doctor Who locations so I hope to tell you all about them. Please come back and read my posts and tell me what you think. Please be my companion! 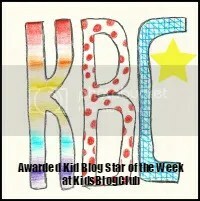 Enter your email address to follow this blog and receive notifications of new adventures by email. Winner announced- Christmas competition! Win an official Doctor Who personalised sign. Project Indigo Christmas Competition – Win an official Doctor Who Personalised Sign! Now Closed. I like tea and coffee, fantasy, healthy food and hippie clothing. And I love bright colours. "Be good to your data, and it'll be good to you." My experiences as a Doctor Who and classic TV fan. It's bleeding weird having half the Tudor nobility ligging around on motorized bicycles!